Florida Native Americans are people identifying or identified as Native American sampled in the state of Florida. This data set seems to include several types of American Indians, particularly Creek or Muscogee, Seminole, Choctaw and Cherokee people. 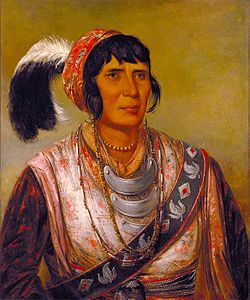 The Seminole leader Osceola was of Creek, Scots-Irish and English parentage. The Native American – Florida population data represent DNA samples from 105 Native American (Native Americans in the United States) individuals in the state of Florida. Samples were provided by the Palm Beach County (Fla.) Sheriff’s Office. For more details on this population, see Native Languages and Indigenous Peoples of Florida. For details on the federally recognized Seminole Nation and Miccosukee Tribe, see Seminole Tribe and Miccosukee Tribe, respectively. The Creek warrior Osceola was painted by George Catlin shortly before his capture by treachery at the hands of the U.S. Army in the Second Seminole War. His treatment caused a public outcry. The Second Seminole War, often referred to as the Seminole War, was the most expensive Indian War fought by the United States. It was never officially concluded.